Join Steve, Blue and all their friends as they plan a backyard musical show! Pre-schoolers will help Steve and Blue get the show underway, write an all new song with G-Clef the voice of Ray Charles and, of course, play Blue's Clues. 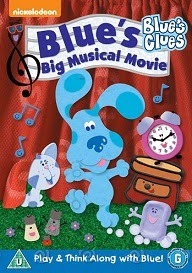 In Blue's Big Musical Movie, pre-schoolers will sing, dance, play and learn that they can be anything they want to be!